The Perth Wildcats will tonight play their first home game at the new Perth Arena. As you may have heard already, the game will break ALL WA records for the most number of people at a basketball game, and possibly break some NBL records as well with the 12,000+ people expected for the game. If you are heading to the game, and you've never been warned, remember to wear a red shirt! It's a very big season for the NBL with broadcasting deals reached with free to air TV, online and on the radio. 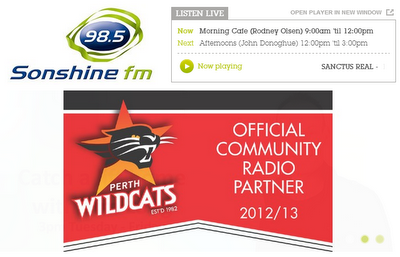 For example, you can listen to all Perth Wildcats games live on the radio by tuning to 98.5 Sonshine FM which can also be streamed online if you don't have a radio nearby. The NBL this year introduced their own online streaming service for fans which costs $59 for access to all the games. You can subscribe at NBL.tv. We thought it would be good to also let you know something you might have missed about NBL coverage. A little known fact is that iiNET, naming rights sponsors of the National Basketball League, have been given the rights to broadcast one game each week LIVE and free for their customers. Note that this service is only available for iiNET customers, who can also access on-demand videos of the games that were broadcast live, a few days after they were shown. Today's game between New Zealand Breakers and the Townsville Crocodiles will be shown live at 2:30pm WST (follow twitter commentary at #NBLNZBTSV) and the following week, the Perth Wildcats v New Zealand Breakers will be shown live at 7:00pm WST (Twitter #NBLPERNZB). Channel Ten will also broadcast two games each round including one on Friday night on ONE HD and also the Sunday afternoon games on TEN. Tonight's Perth Wildcats game is going to be replayed on ONE HD tonight at 9:30pm which will be live for Eastern States viewers.